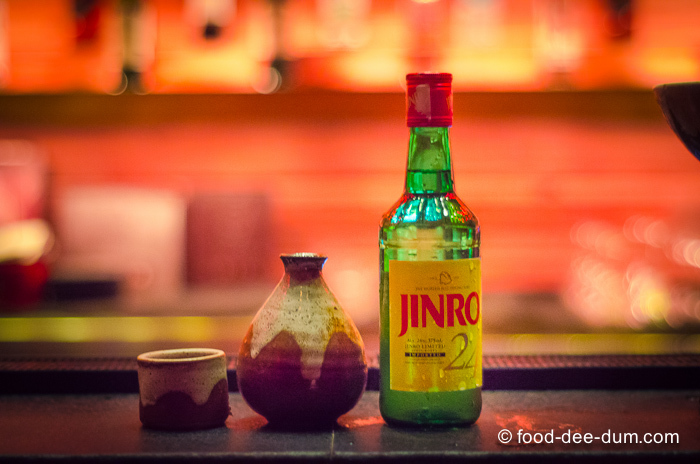 Soju Bomb-ing India: Jinro Soju 24 now available in Delhi. 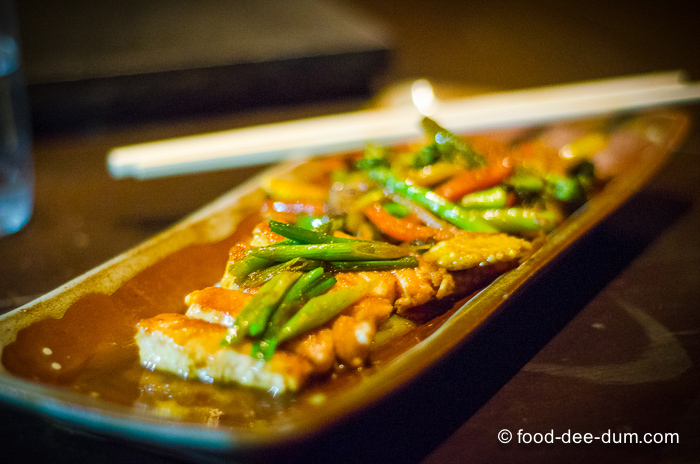 I recently had an opportunity to try out Jinro Soju 24. When I got the call from Jinro, I was a bit apprehensive because I hadn’t tried Soju before. To be honest, I am not very familar with Korean cuisine and even less so with Korean liquor! The apprehension was quickly overtaken by excitement to try something new and I accepted the invitation after only a moment’s hesitation. 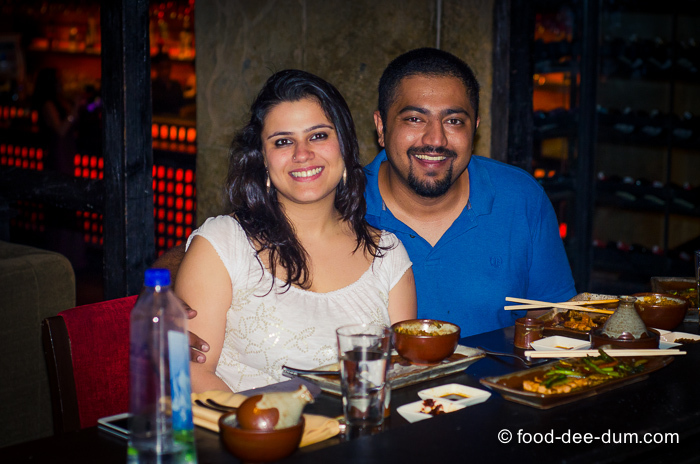 The kind folks at Jinro hosted AK & I at Shiro Delhi and we had a fantastic experience. Taking a cue from there, I decided to turn this into a Soju 101! The information below is primarily a combination of what we tasted, heard & learned during our experience. The blanks were filled in with some elementary research online and by Jinro themselves. Soju is the best known Korean liquor – a distilled, vodka-like, rice liquor. Traditionally made with rice, barley or wheat, modern manufacturers often use other starches like potatoes, sweet potatoes and tapioca. We were told that the varieties made from the latter tend to be cheaper and not quite as refined (read, can taste quite vile!). It is clear and colourless and its alcohol content varies from 16.5% – 45% Alcohol by Volume (ABV). When I first read that Soju could theoretically contain upto 45% ABV, I had horrific visions of AK having to carry me over his shoulder out of the restaurant! Fortunately for him, and as the name Jinro Soju 24 may divulge, the variety we tried contained a modest 24% ABV – a good one to start with! As per the instructions on the bottle and a few suggestions online, I discerned the following: It is almost always served chilled. Soju can be sipped neat or on the rocks. It can also be tossed back like a shot, plain or with a dash of lime. It can be used as a base for popular cocktails like Martini, Bloody Mary or Mojitos – it does exceptionally well when paired with citrus or tropical fruit flavours. A Soju bomb (much like a Sake bomb) is another popular way of consuming Soju — placing a shot of Soju in a mug or glass of beer. 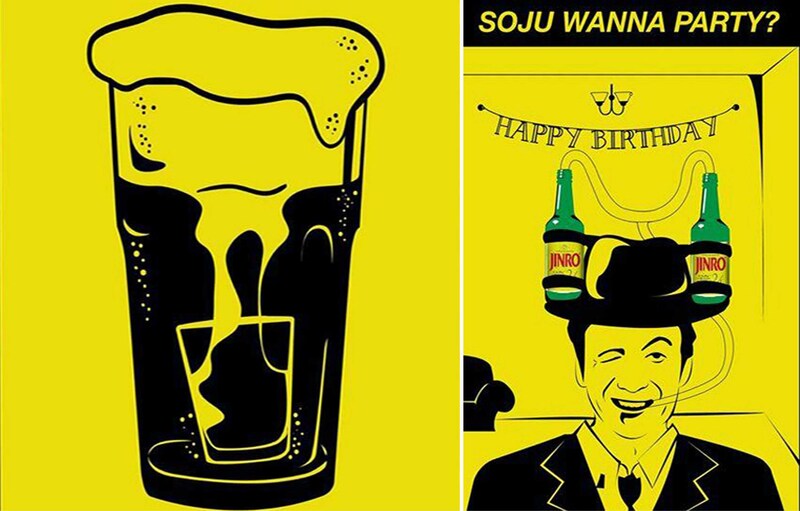 A definite party starter, Jinro has launched itself in India by asking people to “Soju Bomb” their friend’s birthdays by nominating them on an app. Check it out here. A somac is another way to have it with beer (SOju + MACju/ Beer), prepared using a method called “manufacturing”, usually in a 30:70 ratio. The ratio need not be the same every time and you can use a custom glass like this somac glass, which defines the effect of the somac ratio in terms such as “golden ratio” and “Caution: Black-out, dead drunk”. It can be made and consumed in many ways and this article from Korea Times talks about the art of drinking Soju and beer cocktails, describing in detail variations like The Hurricane, Air Force One and Hole-in-One. AK & I decided to go with the classy approach (!!). We decided to sip on it, chilled and straight up, served in the traditional cups. Here’s a picture of our bottle, being chilled on ice. The servers poured the Soju into the chilled ceramic jug/ decanter before they served us in the small cups and continued to top them up as necessary. Here’s a better look at the bottle, the jug and the traditional shot glass. We sipped on it delicately for the better part of the evening and our glasses were generously topped up at regular intervals. Chilled, it tasted mellow and had just a hint of sweetness. The adjectives that came to my mind were “clean”, “crisp”, “light” and “smooth”. Fresh, grassy and citrusy are the minor notes that I felt as well. The 24% ABV allowed us to consume quite a bit of it without even realising how much we actually consumed — no headache and no aftermath. And the best part? Even though we consumed it neat, it didn’t have the after-burn of the average vodka and no aftertaste of alcohol or spirit, despite the absence of strong, defining flavours. Even though, in terms of characteristics, the logical comparison of Soju is with vodka, I felt that the experience was more like sipping delicately on wine. Just smaller sips, thanks to the small traditional cups. It paired very well with the food that was served to us and we enjoyed the little ritual of pouring it into the iced jug and then into the individual cups. Sure, it’s an added step, but what is a night out without a little fuss? Soju pairs well with most spicy and BBQd food, mainly seafood, pork and beef. 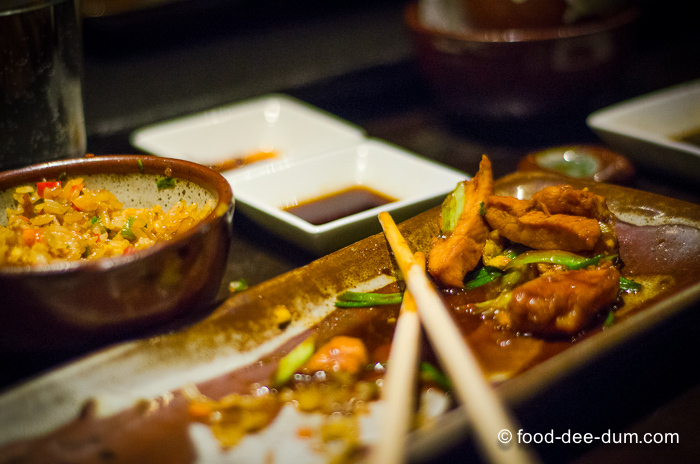 This falls in well with Korean cuisine but also with the spice of Indian food. 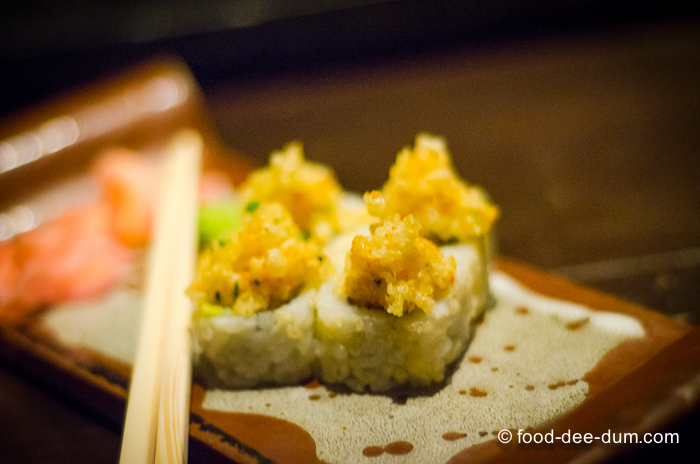 Since we were hosted at Shiro, our meal was mainly Japanese and served upon the recommendations of the Japanese Chef. Our fare consisted of pork dumplings, sushi and main course prepared on the teppan (more details given below) – the Soju paired wonderfully with all the above. I haven’t read about this anywhere, yet, but I would imagine that Soju would make a wonderful ingredient while cooking meats, just like Sake and White Wine. Drinking Soju, like most other forms of Korean liquor, is not a casual exercise. It is full of ritual and etiquette. Koreans drink with their friends and family and there is an unwritten, but clear, code of conduct regarding the serving, receiving and consumption of liquor. Although we didn’t experience the traditional etiquette that surround the Soju ritual, I dug some out of the internet to share with you. When receiving a glass from an elder, one must hold the glass with two hands (left palm on the bottom & hold the glass with right hand) and bow the head slightly. When it is your turn to drink, turn away from the elder and cover your mouth and glass with hands. On a lighter note, some reviewers claim that this action is a reflex when drinking bad Soju because it causes you to gag! If you are pouring a glass for others, hold the bottle with your right hand and support your right arm with your left hand by touching its elbow. 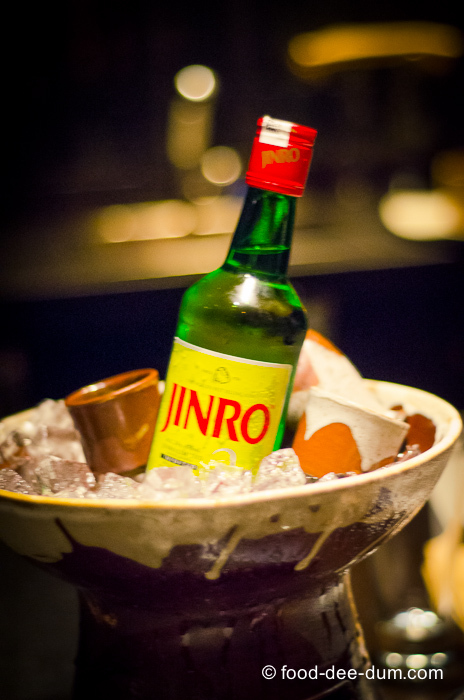 Jinro’s Soju is the largest consumed liquor in the world. 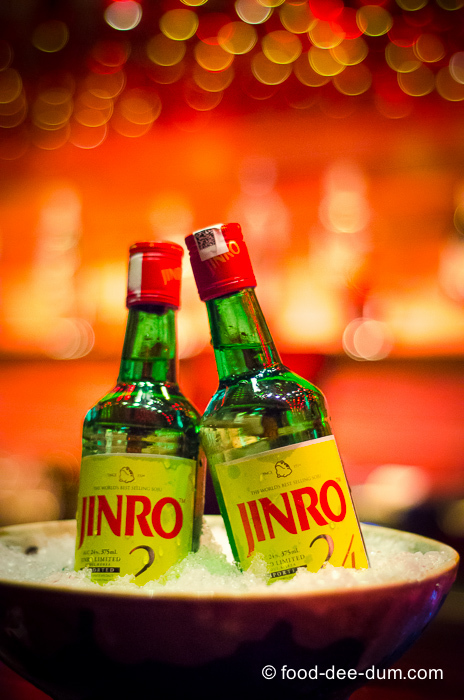 According to CNN Travel, in 2011, Jinro sold 61.38 mn cases worldwide and was seconded only by Smirnoff at 24.70 mn cases. 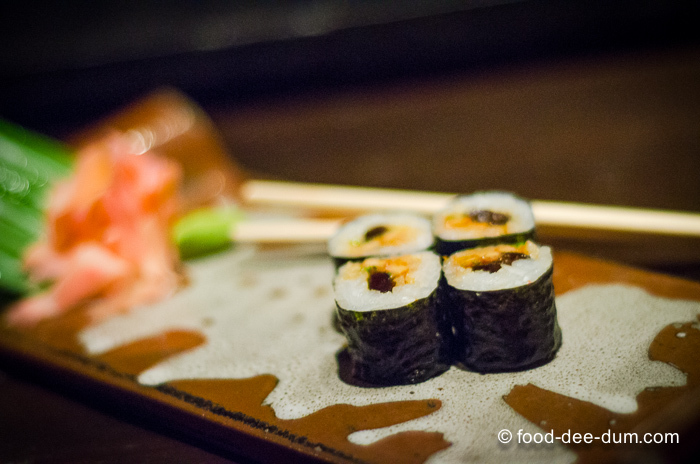 All-in-all, we had a fantastic first experience of Jinro’s Soju 24. Too bad I tried it a few days after my birthday and will have to wait until next year for a Soju Bomb party! If you do happen to try it, do leave me a comment to share your thoughts. I would love to hear from you. Can you tell that we are fully “fed” up and quite happy?